The digital age is here to stay. And while many businesses strive to go paperless, some cannot have a completely paperless office. Accounting firms are top of the list where printing is not going anywhere anytime soon. At least not when you need to crunch numbers and confirm business expenses and financial records in a month. That’s where a printing calculator comes in. Shopping for a printing calculator is just as hectic as picking a regular calculator. Many manufacturers have come in to fill this niche bringing in many brands and models to compare. Before you head out and pick the first printing calculator you find, you’ll want to consider a few factors and features on the said printing calculator. Here, we’ve put together a list of five best printing calculators 2019. We’ll be looking at what they are best at, along with the features that make them unique. Let’s take a look. 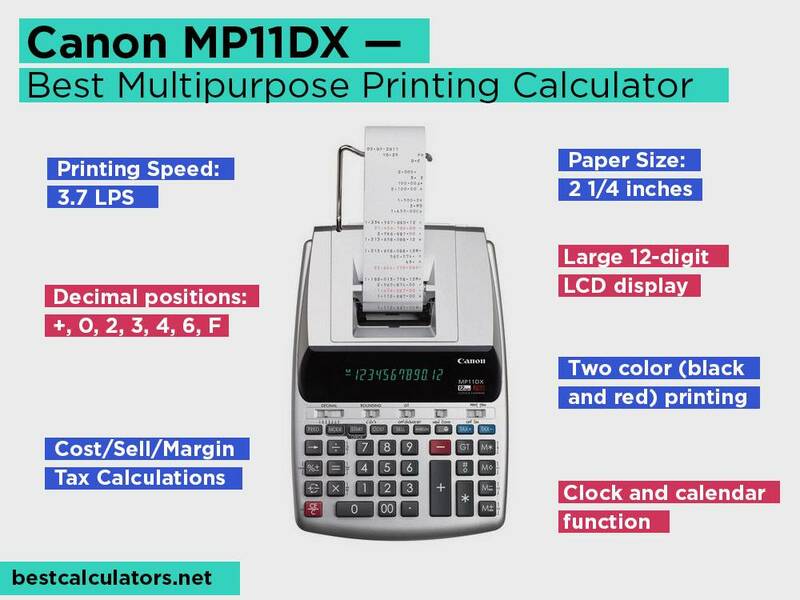 What is the Best Printing Calculator in April, 2019? 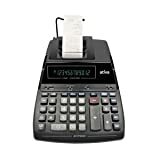 Casio HR-100TM 2 lines per second 2 ½ inches IR-40T AC-AD-4150 power adapter or 4 AA batteries ⭐️⭐️⭐️⭐️⭐️ Check our Review! Canon MP11DX 3.7 lines per second 2 ¼ inches DPS-R3027 Ac Adapter ⭐️⭐️⭐️⭐️⭐️ Check our Review! Sharp EL-1197PIII 4.5 lines per second 2 ¼ inches DPS-R3027 Ac Adapter ⭐️⭐️⭐️⭐️ Check our Review! Victor 1460-4 4.6 lines per second 2 ¼ inches Victortech 7010 ink ribbon Ac Adapter ⭐️⭐️⭐️⭐️ Check our Review! Ativa AT-P3000 3.7 lines per second 2 ¼ inches Swartz Ink AT-P3000 compatible ribbon Ac Adapter ⭐️⭐️⭐️⭐️ Check our Review! 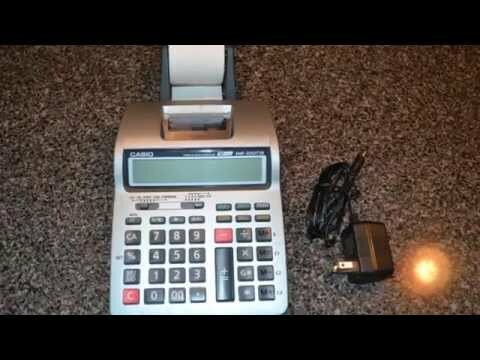 Whether you want a small calculator for office use or personal budgeting, the Casio HT-100TM is a great pick. It comes in a compact size to fit limited desktop space. You’ll be able to squeeze in this calculator even if you are tight on space. Casio is a renowned company in the electronics industry. Their products perform with excellence. As you can see from the looks of this calculator, it has been around for some time. As a printing calculator, we expect it to fulfill its specifications as it stipulates in the description. And true to it, this calculator prints 2 lines per second on a 2½-inch printing paper. This will save you time when you need to perform fast calculations and present them in the form of receipts to your clients. You’ll like that it is a 2-color printer making it easy to distinguish what you input for printing. It will display positive values in black while negative values are displayed in red. As an accountant, you know how important it is to visualize numbers in color, and this is what Casio is all about. If you choose to use this calculator in the office, you’ll be glad it has a wide LCD. It allows quick reading of the contents on the display so that you’ll not miss a thing when concluding calculations. Not to mention, it has twelve hard plastic digits that are easy to dial in. You can skip missteps when inputting numbers at high speeds. 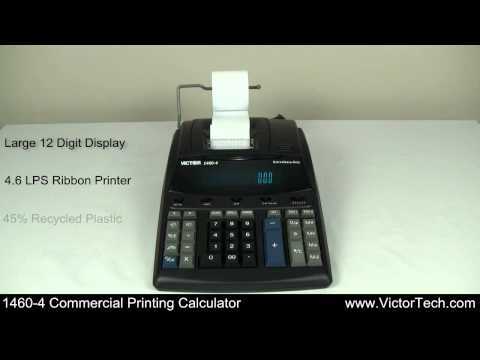 A printing calculator is as good as the functions it brings forth. 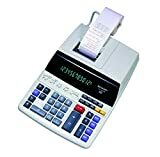 This model packs lots of features including tax and currency exchange, cost/sell/margin, decimal, item counter, round off, round up, and of course the grand total function. It also has essential keys which aid in crunching those numbers. You’ll have the 4-key independent memory, mark up/mark down key, right shift key, double zero key, +/- switch key and the backspace key. These keys make input much faster allowing the user to make quick financial calculations. 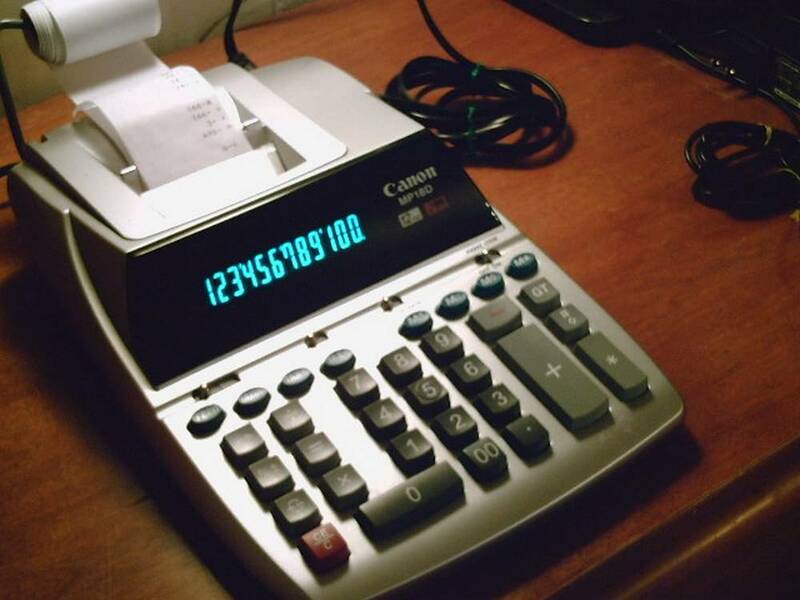 An AC-AD-4150 power adapter is supplied with this calculator. Just plug it in, and the device is ready for use. You will not be worrying about the batteries dying on you on a busy day at the office. Better still, it can again use 4 AA batteries making it more useful when taking a business trip out of town. 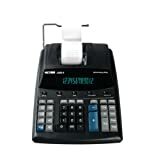 The Casio HR-100TM is a top performing calculator. If you are looking to own a cheap model for both office and home use, it won’t disappoint. You are just a step away from carrying out efficient calculations and reliable printouts. Every busy professional needs a printing calculator they can depend on for their everyday work. Canon brings us one such model in the MP11DX. This calculator combines sophisticated and useful features to make easy calculation tasks. You’ll love it because of the angular screen since you’ll be reading numbers fast and easy. This calculator is equipped with a replaceable ribbon roller that prints with speeds of up to 3.7 lines per second. It utilizes a 2 ¼ inch paper that you can easily find in the office supply store when it needs replacing. Again, it prints in two colors to eliminate any misreads by producing positives in black and negatives in red. The 12-digit display is numeric. The numbers will come up on a fluorescent screen. It is easy to read whether you are in a low-lit office or dazzling light. It’s that reliable meaning you can be sure of the inputs. Canon MP11DX offers time-saving features like the profit margin calculations key. It allows you to calculate the discount or the selling point based on the desired profit margin and cost. It also has the tax and currency conversion feature. You can store a rate using the independent memory key. This gives you fast and convenient access saving you from the numerous steps you have to take before concluding a calculation. This calculator also comes with inbuilt time and date settings plus the clock and calendar function that displays the day and time. It is an all-around calculator that looks sleek even when sitting on your desktop. You get to use this calculator with the regular power outlet using a power adapter. That’s why we see it as a good companion in the office. This means you won’t be taking it to any place without a power source. 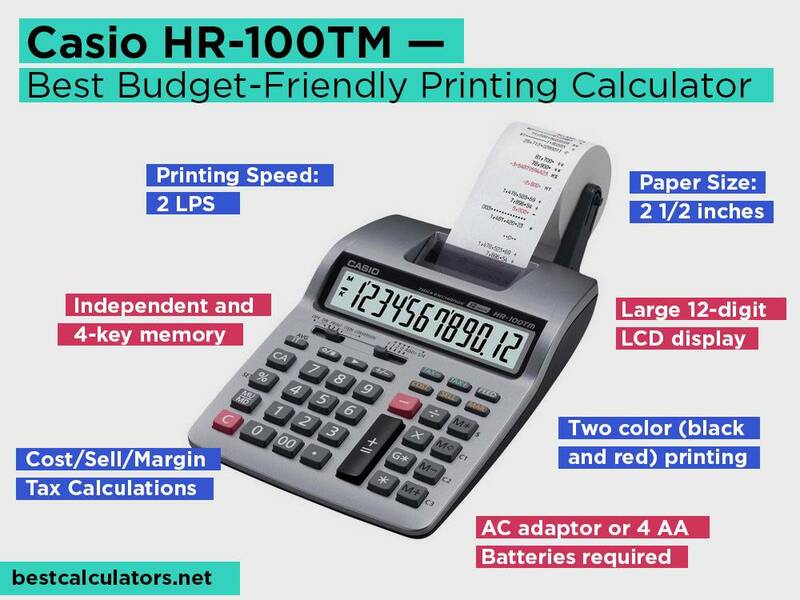 If you want a printing calculator that you can take with you, Casio HR-100TM remains a good choice. All in all, Canon is built for the office. It can print 3.7 lines per second which is much faster than many other printing calculators. The shortcut keys plus the date and calendar functions all make this a handy device. 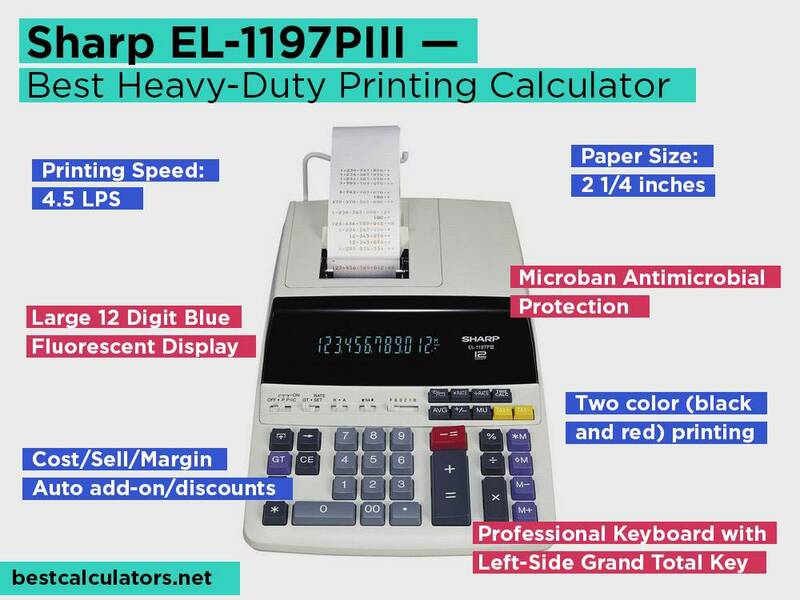 If your office is what you would describe as more than busy, then you need a heavy-duty calculator like the Sharp EL-1197PIII. This model performs both general calculations and advanced financial work making your work easier. It is one of those you’ll be glad you invested in because of the simplified keys meaning you won’t miss even a single entry. It’s hard to beat the speed of a calculator that prints 4.5 lines per second. It is another two-color printer which helps to distinguish both positive and negative numbers using black and red colors respectively. It has date and time prints on every tape. You’ll be able to know when transactions happened such that bank deposits and making expense reports is much easier. Like the Canon, Sharp displays up to 12 numbers on its screen. The 14mm numbers are hard to miss, so you’ll never make a misread. The blue screen is readable both day and night. You can stay up late when you want to meet deadlines, and it will never give you problems. When the majority of people are using the same calculator, germs can easily spread. You will find that if someone has the flu others will quickly catch up when you share a device such as a calculator. But not when you are using Sharp’s EL-1197PIII. It has inbuilt antimicrobial protection with Microban. This feature prevents the growth of bacteria while it’s being passed around in a super-busy office. Sharp buttons will help save you time. It has shortcut keys like the double zero, grand total, and backspace. This way, calculations can be completed in the shortest time possible. It also has the four-key memory that helps users store numbers for easy recall. The memory feature is more useful if you are forgetful; thus it minimizes input mistakes for your business. 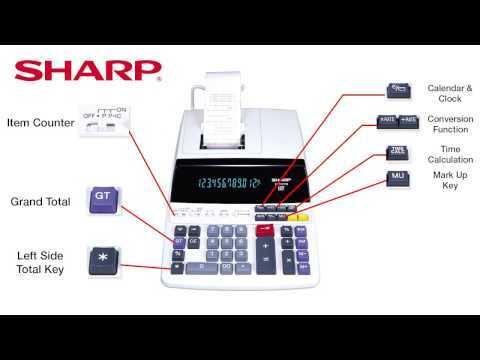 The Sharp EL-1197PIII is a reliable brand that comes in handy to print calculations for accurate bookkeeping. It is a device that is useful in busy offices where efficiency and productivity are what drives the business. It comes with features to minimize time spent on calculation expenses, costs, profits, etc., thus saving your firm time that could otherwise be spent on more productive jobs. 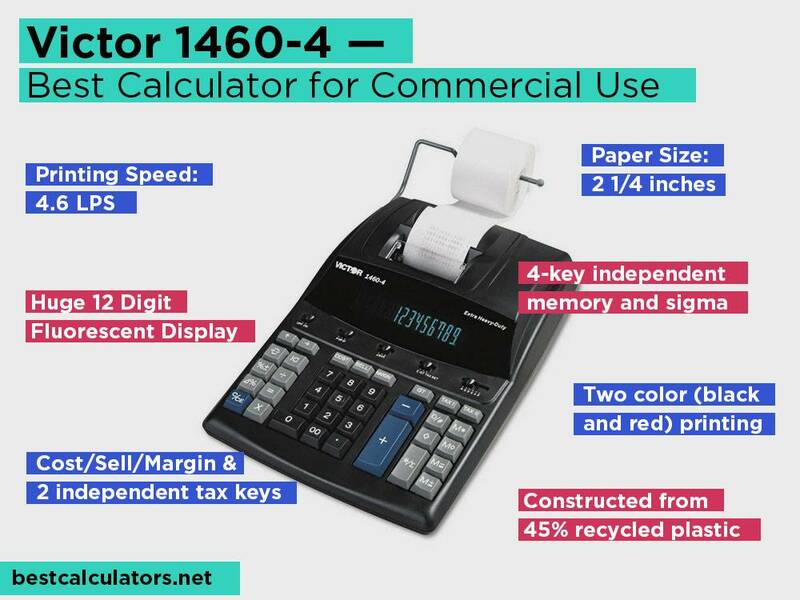 For the advanced user in a commercial setting, Victor 1460-4 is an ideal pick. It features a sleek, black exterior which you’ll be happy to display in a modern office. This is a large desktop calculator so it will be easy to input numbers on a menu that is not cramped. The keys are well-spaced to ensure you can feel which key your finger is striking. It even has the feedback feel you get when you punch in a number so that you won’t do it twice. This device is reliable when you need accurate records of office expenses. It provides fast printing of up to 4.6 lines per second using an ink ribbon. Better yet, it will color code the numbers for a straightforward interpretation of the results. It helps your employees to keep accurate office records especially if you are swamped with work. And it’s easy for them to input entries while confirming if they are correct or not. Your team will love the shortcut keys that make working with numbers simple and even fun. This model has profit margin calculations keys and tax keys. The menu also has the time and date function which stamps the date and time on the receipt. Also, it comes with selectable decimal settings and the 4-key independent memory key. 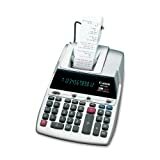 This adding machine is a greatly used for accounting purposes. Every office that needs to keep records of calculations will be happy with to gain access to such records by hitting the keys and getting receipts with speeds of up to 4.6 lines per second. You don’t know the accuracy you are missing until you invest in a calculator designed for the task. Better start with the Victor 1460-4. Keep track of your finances with the Ativa AT-P3000. It is a compact sized model for both office and home use. It helps to organize your finances making it easy for teams to coordinate and complete tasks in time. This Ativa model boasts a hard plastic construction that will last a decent time in great condition. It looks small, but the keys will never feel cramped when you are making entries. Ativa offers you up to 14 functions. You can make quick tax and profit margin calculations. Again, it’s possible to calculate discounts, and enter rates and figures in the 4-key independent memory. You’ll be happy it has an item counter to help keep track of the items you intend to input in your calculations. It comes in handy when taking stock, since figures can be too many to keep track of in the head. This calculator can display up to 12 characters on the screen. Although it is a one-line display, it’s quite effortless to see what’s on it, no matter the time of day or lighting condition. This is an incredible quality not showcased by many models in its class. It allows you to steer clear of any mistakes that could occur due to poor visual display. This is not a heavy-duty calculator, but it has reliable printing speeds. It prints 3.7 lines per second so you won’t be waiting all day to complete receipt work. The calculator also prints in two colors for easy reading. This helps to keep finances in order and even ease the tracking process. 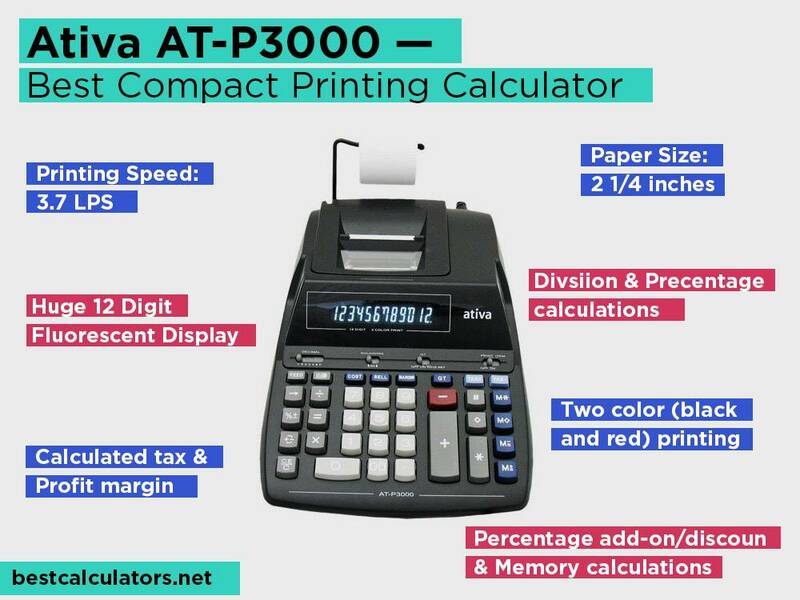 A printing calculator is distinct from other calculators in terms of size and functions. This buying guide gives a few pointers to keep in mind before spending your money on a printing calculator. How does a printing calculator function? 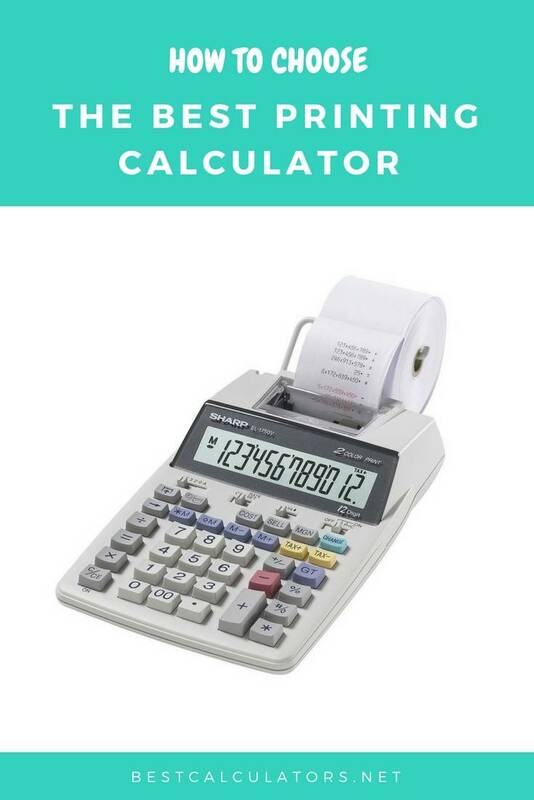 This is a desktop calculator mainly used for accounting purposes. The device keeps a record of what is calculated by allowing those calculations to be printed on paper. The print copies can be removed and even stored as permanent copies. These calculators rely on replacement of paper and ink supplies to maintain the printing function. It has functions tailored for money calculations. Apart from the general adding and subtracting features, these calculators are optimized to carry out advanced business functions. These include the profit margin, tax, currency exchange, percentage values, and many others. AC-Powered. 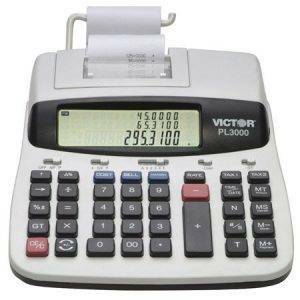 Printing calculators are generally AC powered to save on replacement of batteries. They also prevent loss of work if cells were to die in the middle of a calculation. Allow users to review calculations. The printed receipt can be used as proof of accuracy. It allows users to keep records of finances in an orderly fashion so that they can be reproduced later for verification. High-quality of printing. The printed paper can be stored as they use standard paper and ink used for practical uses. They can be retrieved years later for reference since they follow high printing standards in offices. They cannot be used for advanced school work calculations. Unfortunately, the working of printing calculators is limited to the office setting. They don’t have statistics, graphing, or scientific functions. How do you clean a printing calculator? When you are using a dirty printing wheel, you’ll find that the print copies are dull. Insert the paper roll as we did in the above steps on how to load paper. Date function. The date prints on the copy made so that users can know when a particular calculation took place. It is an important aspect when tracking finances. Item Count. This function counts the number of items in a column of figures on an invoice. The calculator distinguishes whether the user is correcting an error or merely adding a value. Memory. The memory function is associated with four keys which are (M+, M-, recall, and clear). Users can store numbers they’ll need to recall, clear a number, or the entire calculation. Printing tape. Tapes allow the user to check the work immediately they put in the numbers. They allow making a side-by-side comparison and also get a permanent record of your calculation. What is the difference between a printing calculator and an adding machine? The two names are used interchangeably to refer to printing calculators. This is because they provide printed receipts after you make an entry. They accept both numeric and mathematical functions. Which Countries manufacture Canon Printing Calculators? Canon Printing Calculators feature a speedy and durable printing unit for clear print copies in two colors. The quality of the calculator is the same no matter the country of manufacturing. Every Canon printing calculator will have an ergonomic keyboard and large display to facilitate heavy-duty office and home use. A printing calculator plays a crucial role in your work as they help you skip the tiring process of crunching the numbers you are calculating. We’ve outlined the top performing printing calculators with the hope you’ll find it insightful as you pick a printing calculator for the office or home use. The printing calculators in this article are from reputable brands. They feature high printing speeds alongside money calculating functions like tax and profit margins. They are also plug-in calculators allowing users to use them without risking work loss if the batteries die. We believe you’ll find them functional enough for your calculation and printing needs. Pick yours and start enjoying the benefits of a quality printing calculator. Great post. Thanks for sharing. 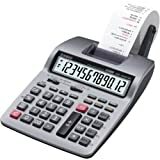 Is there any scientific calculator which has printing option in a cheap price?